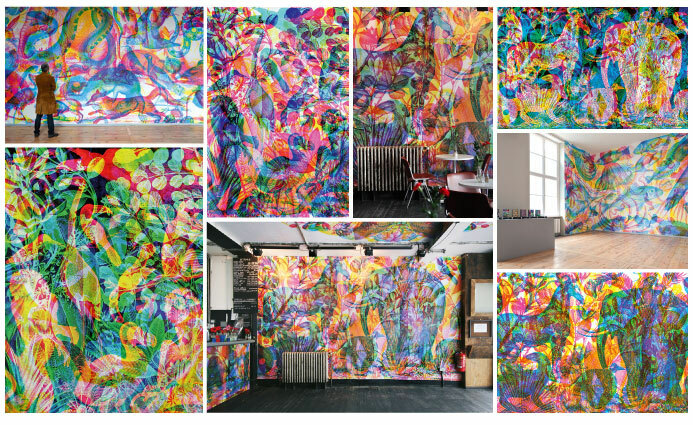 Frescoes and artistic wallpapers infuse our interiors with the air of an art gallery. Sometimes drawn freehand, sometimes temporary, these colored flats are pushing the walls in a highly creative way. Since the Renaissance, frescoes painted by the greatest masters have adorned the walls of palaces and churches, royal dwellings and cathedrals. If they instill a form of timelessness and immortality, and improve simple daily surroundings…if the abstract De Stijl movement was one of the first to impose forms of colors, dear to Piet Mondrian, to liven up living spaces, the creatives of today are pushing this legacy one step further. 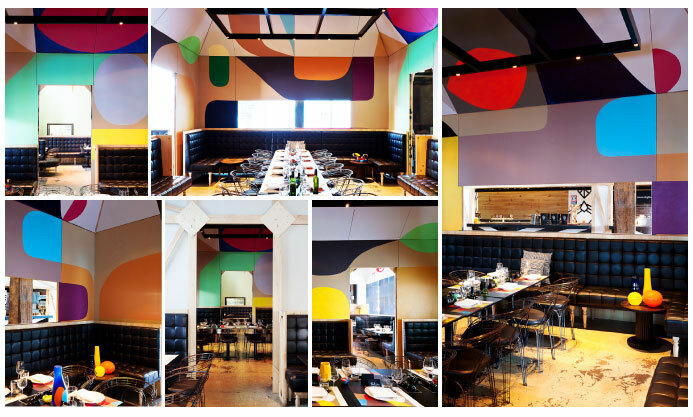 More atonal, the Skopik & Lohn restaurant, established by Horst Scheuer and Constance Fehle in Vienna – in reference to two Austrian gourmets in the then highly emerging area of Karmelitermarkt – is animated by a huge graphic fresco by Otto Zitko. Bordering on visual overdose, the black and white scribbles succeed in reconciling the graphic art with white tablecloths and creative cuisine. At Omar’s, an elegant restaurant that looks like a private club and opened in early May in New York, the illustration by artist Ian Sklarsky (www.iansklarsky.com) uses the method of ‘Blind Contour’ to draw urban landscapes, free hand – in this instance portraits and scenes of typical Manhattan streets – where the bumps create a hyper-realistic mural. Quite a feat of penmanship. Riding this realist wave, dear to the German Expressionist artists, the new Miss Ko restaurant designed by Philippe Starck on Avenue Georges V in Paris, compiles faces into a dense dreamscape. Again, the star designer uses a recurring principle, the fresco, to give a single dimension volume, as he did at Le Meurice in the past. 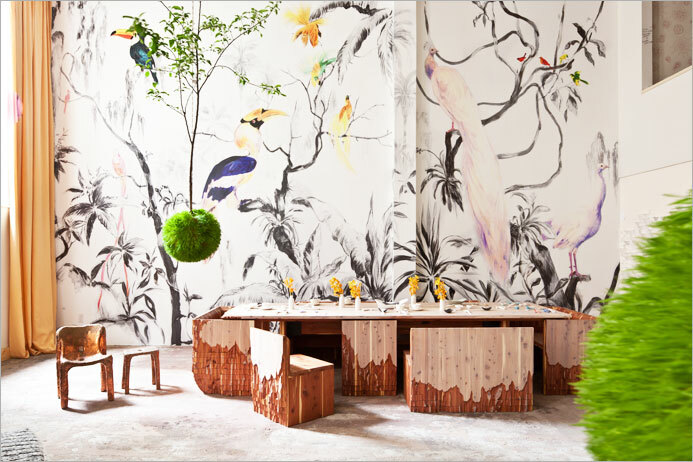 And finally, in continuation of the jungle theme, the ‘eroded’ wooden character of the custom-made sculpted table by New York designer Alex Gil, exhibited at the Boffo showroom, perfectly matches the lush ‘Tropical Birds’ wallpaper designed by Argentine born, Antwerp based artist Pablo Piatti, printed in collaboration with Tres Tintas Barcelona. And just like that, our wall spaces are also destined to become true works of art. To your pencils.